At the end of each month I am going to send out a summary of the highlights of the month and update you on our plans for upcoming trips and activities. Here is the summary for April 2018. Follow me on social media or by email to see the full posts coming up soon. I’ve just hit “publish” on this post while sitting at my own dining table, back home in Adelaide, Australia. We got home early this morning after 54 weeks of travel. It still hasn’t quite sunk in that we are home, but boy, I am looking forward to sleeping in my own comfy bed and washing my clothes without having to hunt down a laundromat or hand wash in the bathroom sink! I am even looking forward to cooking meals in my own kitchen – and I really don’t like to cook. But I can tell you all about my new domestic bliss next month, this post is about April…. At the beginning of the month we were in Portugal. It was Easter Sunday and April Fool’s Day, but for us it was a travel day. We woke up in Lisbon, then jumped on a train up to Porto. We spent five nights in Porto. I had come down with a slight cold, and as the first day was cold and drizzly we stayed inside, keeping warm and finalising our whole month of bookings. It was nice to know that apart from one small trip between Bordeaux and Paris, there was no need to research anything else. 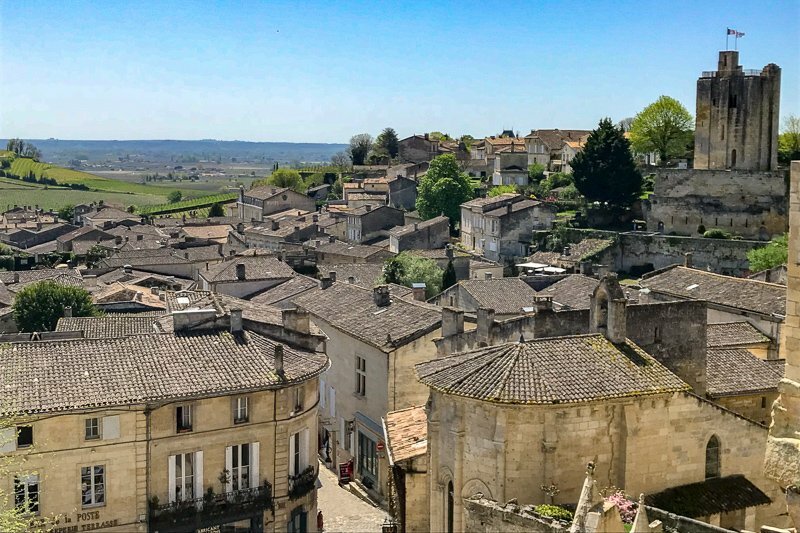 The Bordeaux-Paris trip had me in a quandary. There were train strikes going on, and Air France was also striking, and I wanted to wait until closer to the date to see which one of these was less risky to book. I didn’t really want to contemplate an 8 hour bus trip, and we couldn’t hire a car as our international licenses expired before then. We did two walking tours to different parts of Porto, and also a port wine tasting tour. 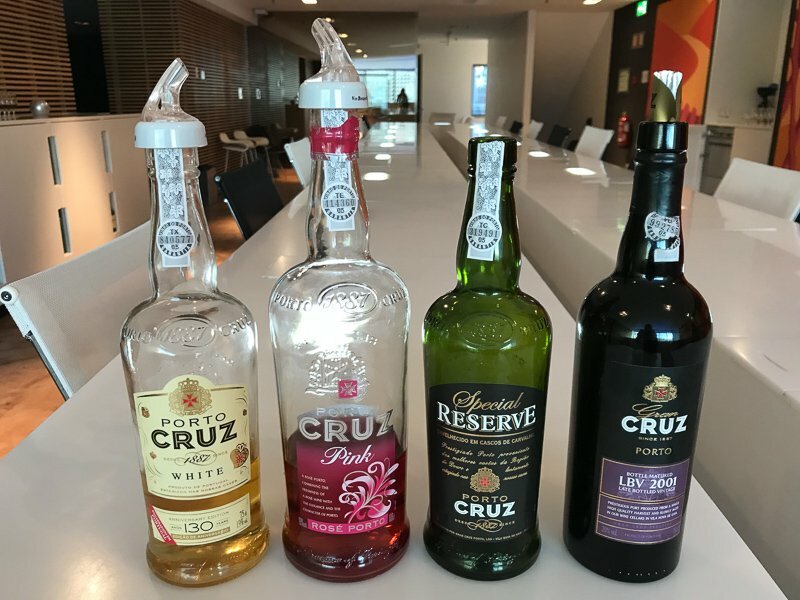 I have never been a fan of Port, but how could I come here without testing out the real thing? That would be like going to the Champagne region in France without doing a tasting. We had a great day with a fantastic group of people, and I have to admit, Port isn’t so bad when you drink the decent stuff! We tried a few of the local delicacies – if you can call them that! 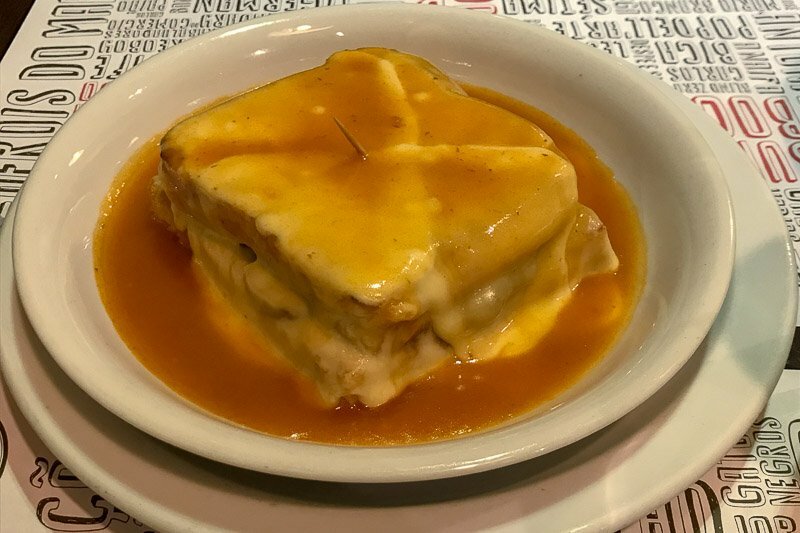 The local heart-attack-on-a-plate meal, called francesinha, is like a completely over the top toasted sandwich, with ham, cheese, steak, and sausage, covered in more cheese, then drowned in a special beer sauce. Sometimes it is also served with a fried egg on top, but we decided to forgo that and try the plain version. It is usually served with a mountain of fries too. A local could easily eat one serve of this for lunch, but Simon and I shared and still struggled to get through it. It is okay, but much too greasy and heavy for us. Glad we gave it a go though. Porto’s favourite fast food, francesinha. From Porto we flew into Gatwick in the UK. We were going to spend a few days with some friends we met all the way back in Italy in May last year. We had kept in contact and were really looking forward to catching up with them for the weekend. On the Friday afternoon while they were at work Simon and I caught the train down to Brighton to check out this iconic English seaside town. 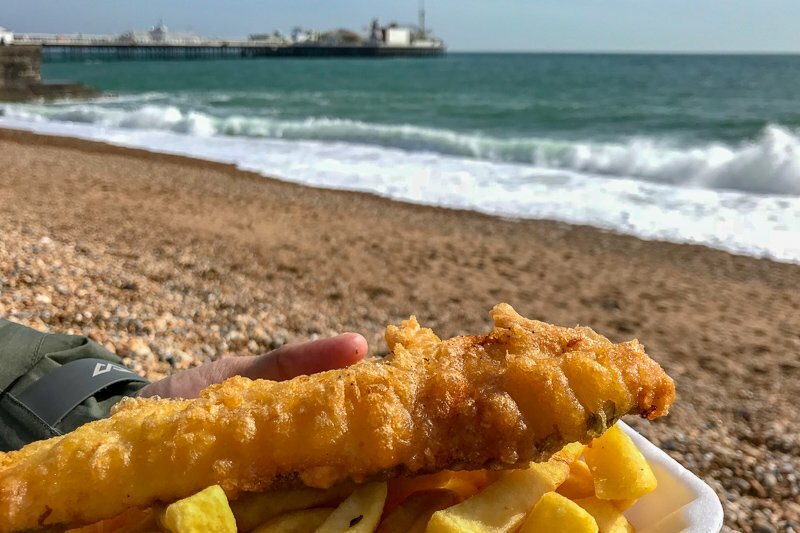 We had a great afternoon eating fish and chips and scoffing at the pebbles that make up the beach here. We walked on the Brighton Pier and checked out the little laneways for quirky shops and great street art. We also checked out the Brighton Dome and the amazing Royal Pavilion that looked like it should be in India. The rest of the weekend we spent at the local pub! Okay, not really, but we did pop in a few times and had dinner there Saturday night. 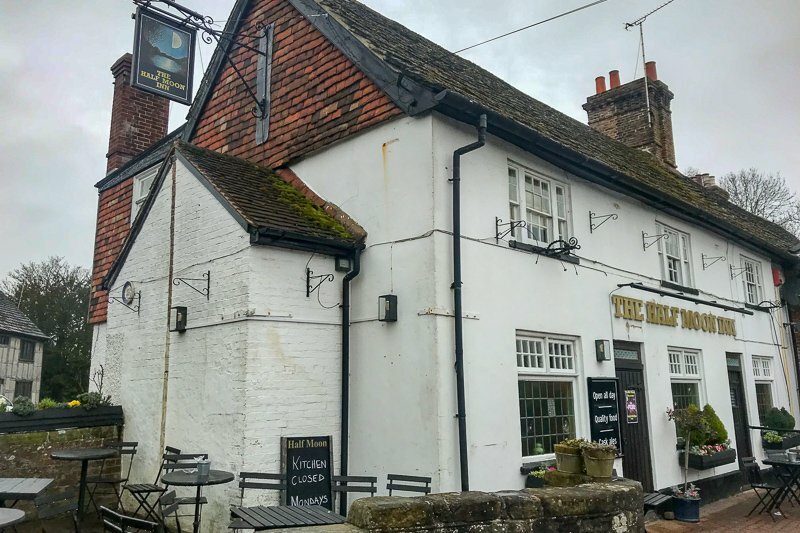 This was in a small English village so the pub was filled with quirky locals and it was so much fun. I am a small town girl, so I felt right at home in this friendly environment. The whole weekend was fantastic, and I am looking forward to catching up with Nick and Claire somewhere else in the world, maybe even in Australia. The bad weather had been following us around, and that didn’t change as we flew up to Edinburgh for a few days. It was like we were beck in Scandinavia. In fact it felt worse, because there was a freezing cold wind that chilled right through to the bone if we were out in it for too long. It also drizzled for nearly the whole time we were there. Of course we didn’t help much by insisting on doing some walking tours. Our guides were absolutely brilliant though, and made every second of it worth our while. We of course visited Edinburgh Castle, and learned a lot about the origins of Harry Potter and where some of the names and places come from. I can’t wait to share some of the local gossip with you when I write about our visit. 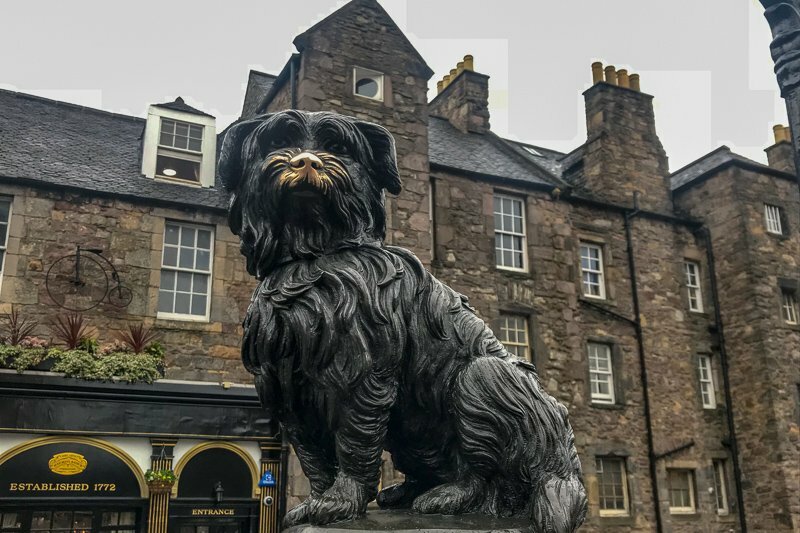 Greyfriars Bobby – is his story fact or fiction? The folk of Edinburgh certainly believe it. The windy forecourt to Edinburgh Castle. This is where the temporary stadium is built each year for the Edinburgh Tattoo in August. From there it was on to our final European country, France. We flew into Paris and decided to risk the trains even though it was a strike day. Soon it was like sardines in the train, and then we had possibly the worse incident of our trip – Simon was pickpocketed. He knew pretty much immediately but the culprit had squeezed through the crowd and was off the train before he could do anything. It was not a huge drama though, because I have had contingecy plans in place for exactly this situation. Firstly Simon carried two wallets, one with cash and the other with cards – it was the card wallet that was stolen so we didn’t lose any cash at all. The travel cards he had – both debit and credit – were not linked to any of our main accounts so there was no fear that a thief could access large amounts of funds. As soon as we got to our accomodation he rang and cancelled the cards at no loss to us. (Although they had been used, including one transaction where even though the pin was wrong, the bank approved it as a “courtesy”. Simon got an email to let him know they had done it! The bank has to cough up for that one!) I also carry completely seperate cards, which I’ve had to drag out of mothballs and hope that I remember the pins! So far so good. We were only in Paris as a stepping stone to Bordeaux. Our first day was spent doing exciting things like laundry, but on the second day we met up with a bunch of other Aussie’s (and a couple of New Zealanders) in preparation for our road trip that was starting the following day. 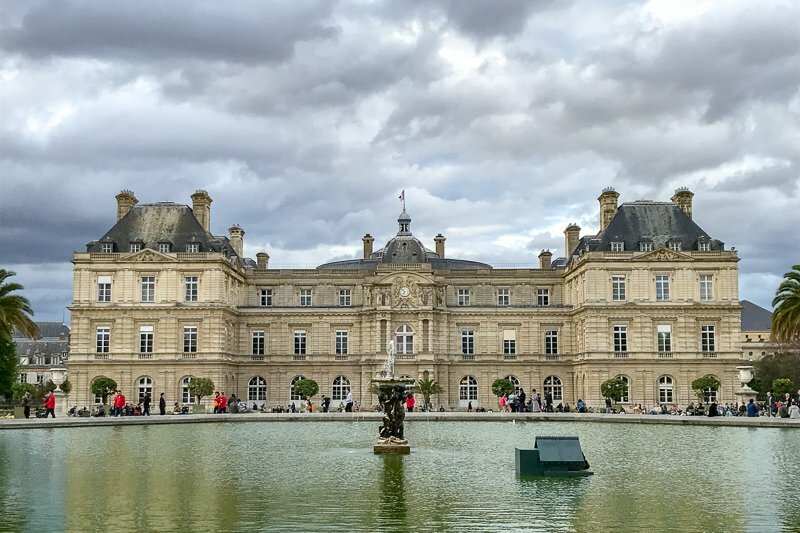 We spent three days driving down to Bordeaux, with stops at Monet’s Gardens, the Bayeaux Tapestry, Mont St Michel, and the stunning little town of St Malo. It’s no secret that I am not a real fan of Paris, but once out into the countryside, I warmed to France a lot more. We were all going to Bordeaux for the annual International Bookcrossing Anniversary Convention. Here we were meeting over one hundred other Bookcrossers, including even more of the people I know from Australia. I’m sure at some point these conventions were about the books, but in recent years it seems to have become more and more about catching up with the people, with an occaisional book mentioned. We don’t really discuss books though, it’s more of a huge book swap. Before the convention started properly on the Friday, we spent a day out in the French countryside, first visiting the largest sand dune in Europe at Dune de Pilat, before doubling back to the lovely little town of St Emilion, where we did a short underground tour to learn about the history, and then we visited a vineyard to taste some local wines. It was a long day, and I had wisely decided to skip dinner with everyone on the Thursday night, which looked like a good thing on Friday when some of the others looked like they had a rough night. From late Friday afternoon through to lunchtime on Sunday we were participting in all the official parts of the convention. There were meals out each night as well, so we were really busy, pretty much just socialising with the other attendees. 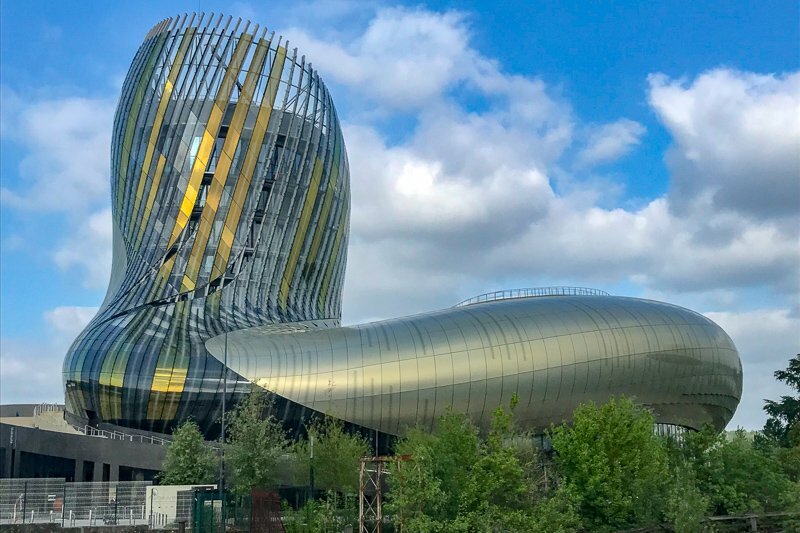 Monday we had to move accomodation, and then we met up with some of the other conventioneers who were still in town to visit La Cité du Vin, Bordeaux’s new wine “theme park”. This amazing museum includes displays on everything you ever wanted to know about wines and winemaking – and probably some thing you didn’t want to know! After a couple of hours looking through the museum we headed up to the top floor to check out the views over the city, and of course to have a glass of one of the wines they had available for tasting. I tried a white wine from Cyprus, and Simon tried a red from South Africa. The following day was more walking around the city then dinner with the last people in town, and Wednesday we took a fast train to Paris. I love these train, and we covered the 600km in around two hours. So convenient, but also a little more pricy than similar trains we took in Italy earlier in our gapyear. 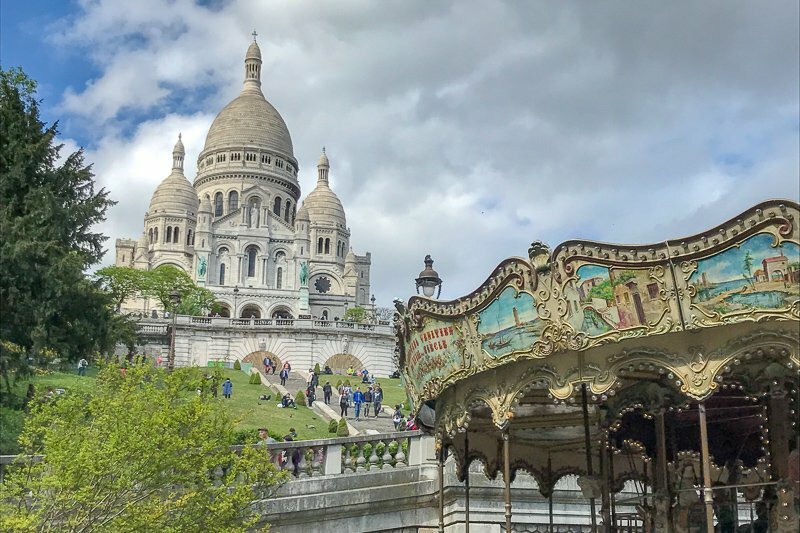 We were staying in Montmartre this time, and even though we had been there before, we had to go for a wander to the Sacre Coeur. It really is a beautiful building. Then it was the beginning of the end – our first flight towards home. I had booked our flights months ago using frequent flyer points, and we were flying business class on Singapore Airlines. This flight was thirteen hours, and we got into Singapore at 7am. We knew we wouldn’t be able to check into our hotel this early, but we made our way there. We were staying at the Hilton Garden Inn in Little India, paid for again months in advance by hotel points. Before dropping off our bags we asked if we could freshen up, and used the showers by the pool. By the time we went to store our bags, our room was ready. It was 10am. We were impressed. We mostly rested during the day, and I had a short nap (Simon had a much longer one!) When bedtime came around though, I was wide awake. I had barely slept on the flight, and even though I had had less than an hour of sleep during the day, my good ole body clock was still working on Paris time, which said it was way too early to go to sleep. By the time my alarm went off in the morning, I had had less than two hours sleep. To try to get back to normal time I wanted to get out and about relatively early. 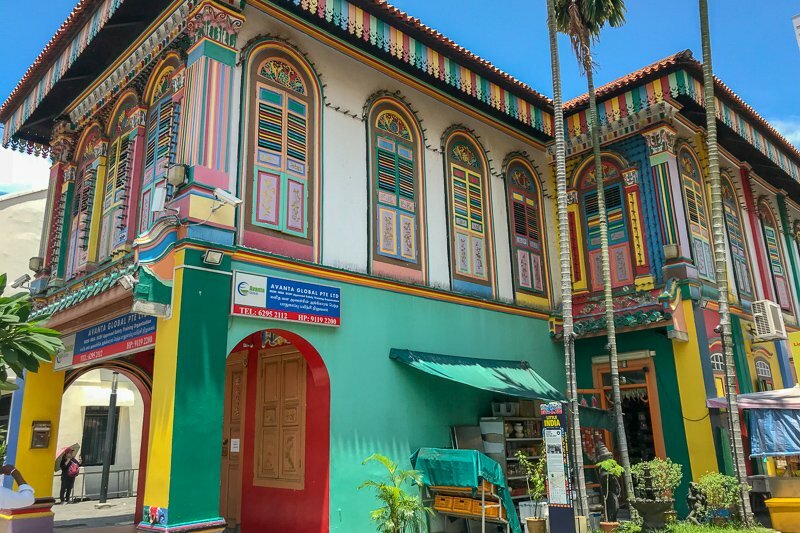 We made our way to Arab Street and Haji Lane to see all the street art and little boutiques. We were a little early though, and couldn’t get our Selfie Coffee as planned as they weren’t yet open. It was about 11am when we decided to move on, and since Raffles was just down the road I decided it must be time to have a look at the Long Bar. As soon as I saw it I remembered – they are renovating! There was a pop-up Long Bar with about ten seats in it, but it wasn’t the same. Besides, at $31SGD ($31AUD/$23USD) a Singapore Sling was not in my budget for this trip! We kept walking until we came to the area where the Merlion is. Every time I had tried to see it in the past it was covered in scaffolding – finally we got to see it this time! Every time I am in Singapore I have to eat a whole pile of amazing food. We spent half a day visiting hawker centres and eating delicious dishes such as Haianese Chicken Rice, Char Kway Teow, Chicken Satays and Green Apple & Mango Chendol. I was also on my usual search for mangosteens – and unless I wanted to buy a big bag of them, I was unsucessful yet again. 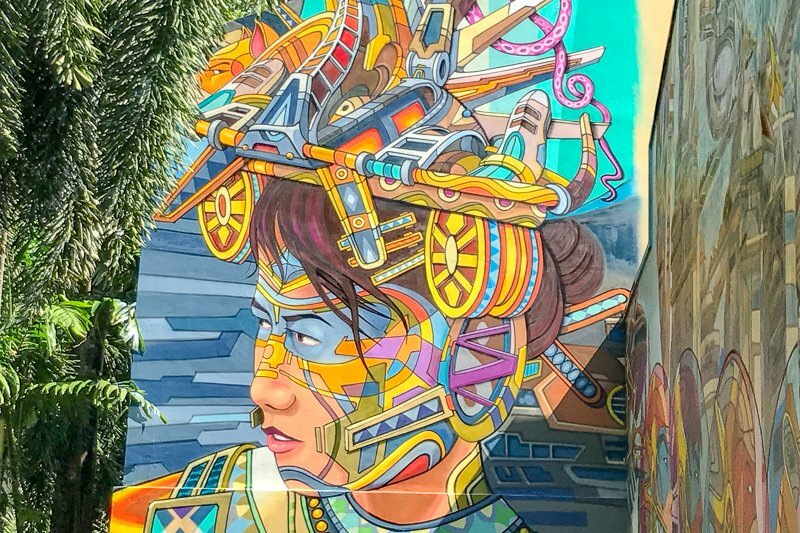 We spent a bit of time wandering around Chinatown, then head over the Clarke Quay. We had been to both of these areas before, but not for a while. We walked through Fort Canning Park and nearly melted in the heat, before jumping back on the MRT to Orchard Road. After cooling down in a mall (there’s plenty to choose from) we did the compulsory Hard Rock Cafe visit, but I couldn’t face another nacho so Simon got tshirt to add to his collection. Then it was our final day in Singapore, in fact the final day of our whole gap year! 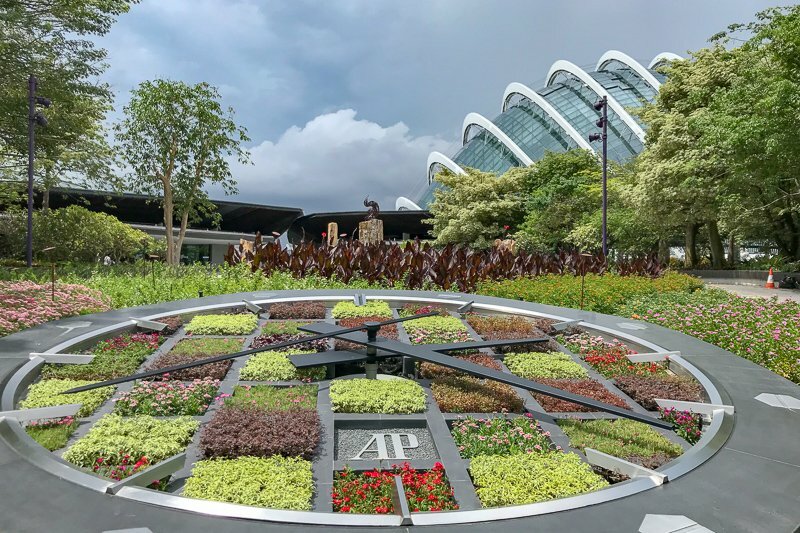 We spent the day at Gardens by the Bay, visiting the Flower and Cloud Domes. We had been into the Cloud Dome years ago, but this time I really wanted to go into the Flower Dome to see the Tulipmania display. Just as we were leaving, it got very grey and started to thunder, so we had a mad dash through the Supertree Grove to reach the MRT station before the rain started. From there is was on to the airport, for a quick catch up with Simon’s cousin Tricia before boarding our final flight home. Guess what? Apart from the flight I got off this morning I have absolutely no travel planned for May! I think I am going to enjoy NOT packing and unpacking. Fairly sure it won’t take too long before I start getting itchy feet though. What I do plan to do in May is to focus on my blog. I already have many of the posts from Europe written, so expect an avalanche of posts to get a bit more caught up. I am hoping to do a few short outings within Adelaide itself. I will be looking after my niece and nephew one day a week, 2-year old twins! In my effort to become the favourite Auntie, I hope to take them out and about and test out some more of the local attractions, that perhaps I haven’t been to since my kids were little. This month has been great socially, but not so great for me producing blog content. I am now two months behind my travels, but I am hoping to catch a lot of that up in May. Even without much new content, my page views have been steady, in fact it’s been my best month apart from the one where my figures were skewed. I’m still not getting rich from this blogging gig – I think this month I have earned enough to buy a pizza at a decent pizza place. If you want to help me buy a drink to go with that pizza, use this Booking.com link to book your next accommodation and once you stay, we will both get a $15AUD reward. Wellcome home again. 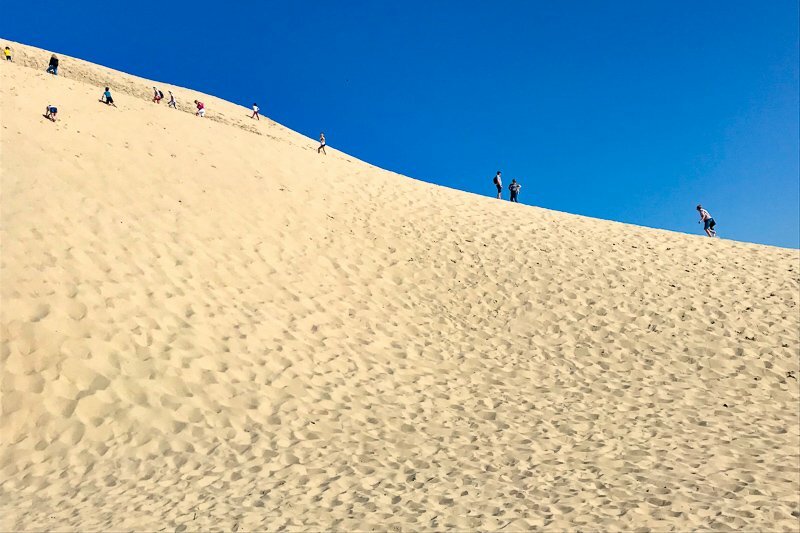 You made an amazing trip – and travel blog as well. I‘ d liked and enjoyed very much to follow your ways. Have a good time & see you next year. Thank you! Already counting the days until we are back in Europe again. Wow! How fast has that little-over-a-year gone?! Welcome back. There’s nothing like your own bed and a nearby washing machine to help you settle back in! Hahaha, yes, thank you! And my washing machine is defintely getting a work out as I pull all my clothes out of storage. Unfortunately the weather is about to change overnight from Summer to late Autumn .. but I’m sure you won’t mind. Thanks Carol. Yes, the weather has been lovely to come home to, but my garden could do with a good water, so I hope there is some decent rain.